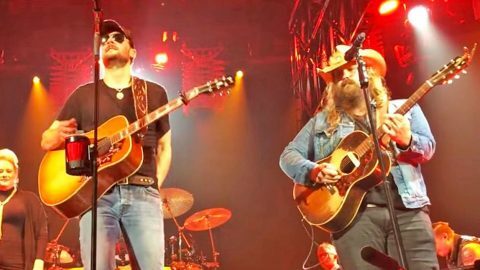 Looking at the current state of country music, Chris Stapleton and Eric Church are two of the brightest stars. Just in the past few years alone, both have experienced unprecedented success when it comes to album sales and concert tickets sold. In 2017, Church and Stapleton were nominated for the coveted Entertainer of the Year Award at the CMA Awards. It was a well-earned nomination on both parts, since Church and Stapleton’s 2017 tours entertained thousands of fans and a number of sold-out crowds. The #CMAawards are tonight! Who should win Entertainer of the Year? So imagine how outstanding it would be to witness two of the genre’s leading entertainers performing together on the same stage. Wait…hold that thought. You see, it’s something you don’t even have to imagine, because it actually happened! Back in May 2015, Stapleton was still relatively unknown to the majority of country fans. His breakout CMA Awards performance with Justin Timberlake occurred six months later, and catapulted him to instant superstardom. Before that, Stapleton joined forces with Church during a show in Bozeman, Montana. They could have performed any song at all and it automatically would have been a memorable performance. But they upped the ante by performing a song that is known worldwide as one of the greatest in history. Titled “The Weight,” the song was originally recorded by Canadian-American rock group The Band and released in 1968. Although the song wasn’t much of a chart success, it had a great influence on American popular music. Because of this, Rolling Stone ranked “The Weight” at the 41st spot on its 500 Greatest Songs of All Time list, which was published in 2004. Since both Church and Stapleton naturally have a bit of a rock vibe, “The Weight” was a song that made perfect sense for them to sing together. Check out just how awesome their duet was by tuning in to the video below! After watching this, we’re itching to see Church and Stapleton collaborate again…and the sooner, the better!